Before revolutions were televised, political cinema enabled large populations to contemplate the machinations and consequences of violent unrest from a distance. Technical advancements helped the cause, allowing narrative storytelling to merge with documentary aesthetics and formulate a new kind of hybrid realism. 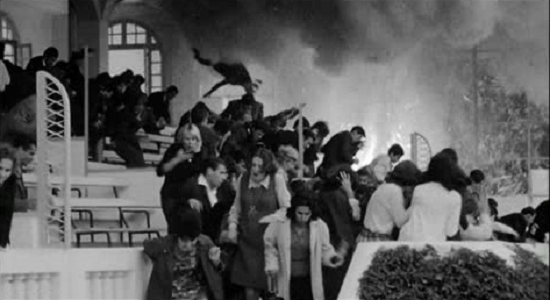 Gillo Pontecorvo's The Battle of Algiers immersed itself in this aesthetic, and might be the greatest film on the subject of insurrection, profiling the Algerian fight for independence against the French colonial forces in such stirring detail that many intense fictional sequences feel as if they are ripped directly from actual newsreel footage. 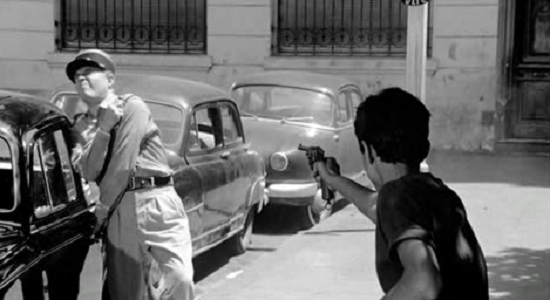 Spanning the conflict's most deadly time period from 1954 to 1957, The Battle of Algiers plunges the viewer headfirst down the narrow corridors of the Casbah District, a predominantly Muslim area of Algiers and the urban haven of the rebel-led National Liberation Front (FLN). Down the steep hill from the impoverished Casbah is the posh European sector where the French police force attempts to subvert the FLN's ideological stranglehold. Communiqués and propaganda speeches inform the ideologies behind each group, but it's just clean surface cover for the messy bombings, assassinations, and torture sessions committed by both sides. War may be hell, but it's also devastatingly cyclical. Instead of sentimentalizing the Arab cause and villainizing French colonialism, Pontecorvo strips away the emotional aspects and embraces a gripping handheld aesthetic. Not only does this establish a kinetic documentary effect, it makes the impact of every shoot-out and explosion a deeply personal experience. This approach defines the introduction of Ali La Pointe (Brahim Haggiag), a low-level grifter who becomes a crucial leader for the FLN after watching a fellow prisoner get guillotined in a French prison. 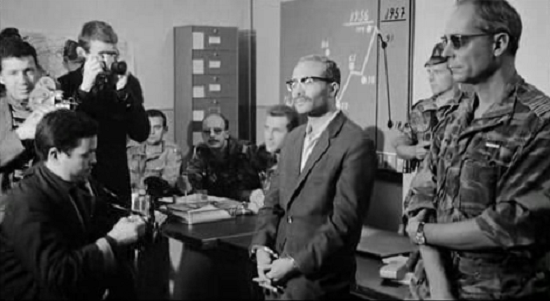 Ali's ideological shift could represent any number of the other Arab characters in The Battle of Algiers, and Pontecorvo makes their point of view a priority immediately before and after sudden bursts of violence. A bomber scans the public room before placing the incendiary device, Pontecorvo's camera lingering on the unwitting smiling faces of the men, women, and children about to die. Later, a tortured informer starts tearing up when he realizes the consequences of his betrayal. These decisions couldn't be more organic. As Ali and his fellow leader El-Hadi Jaffar (Saadi Yacef) recruit young Arab men and women to participate in a brutal barrage of political killings and bombings, the French government in Algiers grasps at whatever colonialist straws they have left. They call in an elite paratrooper battalion, led by Lt. Col. Mathieu (Jean Martin), who swoops down like a hammer from God occupying the Casbah with precision and force after the FLN institutes a weeklong, citywide strike. The ensuing military chess match between the guerilla's and the French shock troops becomes a protracted standoff that erupts into chaos early and often. The film heavily relies on the philosophy propounded by Franz Fanon. Franz Fanon was a Martinique-born French-Algerian psychiatrist, philosopher, revolutionary and writer whose work is influential in the fields of post-colonial studies, critical theory and Marxism. Fanon is known as a radical existential humanist thinker on the issue of decolonization and the psychopathology of colonization. Fanon supported the Algerian struggle for independence and became a member of the Algerian National Liberation Front. His life and works have incited and inspired anti-colonial liberation movements for more than four decades. It is well-known that the ideological teaching Franz Fanon, Algerian philosopher, had an important role in the liberation of Algeria. The notion of identification was a key concept propagated by Fanon. For Fanon, identification was at once psychological, cultural, historical, and political issue. 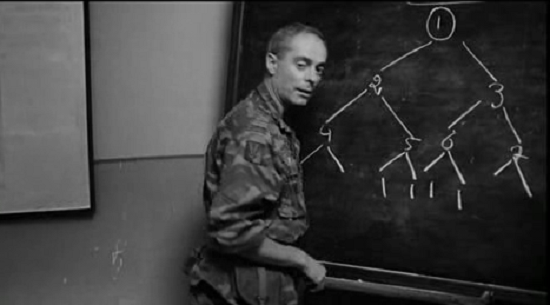 Identification formed part of the very process of production of “Battle of Algiers”. 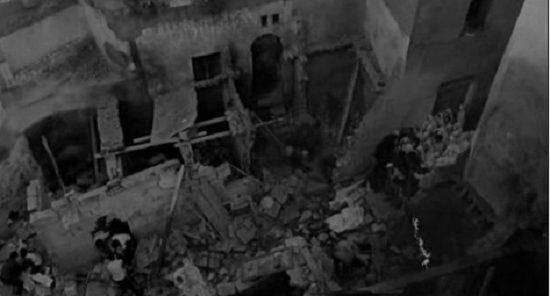 Production accounts tells us that the Algerian extras identified so much with the struggle , staged for the cameras just a few years after the events themselves, that they actually wept as they performed their grief over the destruction of the casbah (Casbah is the citadel of Algiers in Algeria with the traditional quarter clustered around it.). More important, the film sees the event through a Fanonian anti-colonist prism, a result not only of Algerian collaboration in the filming but also of Pontecorvo’s and Solinas’s passionate reading of Fanon. Indeed, sequence after sequence provides audiovisual glosses on key passages from “The wretched of the Earth”; beginning with the film’s dualistic conceptualization of a socially riven urban space. For Algerians, the casbah is home, for the French it is a frontier outpost thus depicting the dividing line between the French and Algerians. While never caricaturing the French, the film exposes the crushing logic of colonialism and fosters our complicity with the Algerians. The film thus practices a cinematic politics of identification. It is through Algerian eyes, for example, that we witness a condemned rebel’s walk to his execution. It is from within casbah that we see and hear the French troops and helicopters. We see the colonized as encircled and menaced and with them we are made to empathize. It is with them that we are made to feel at home. 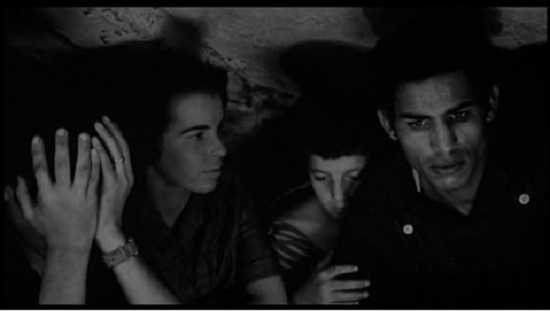 The circular flashback structure of Battle of Algiers begins and ends with scenes involving the tortured Algerian who shows the way to Ali-la-Pointe’s hideout. Indeed, the film is punctuated by excruciatingly painful scenes of torture. Here too Pontecorvo adheres to the historical record by calling to attention to this French practice that was denounced at the time not only by Algerian but also by French leftists like Francis Jeanson, Henri Alleg and Jean Paul Satre. 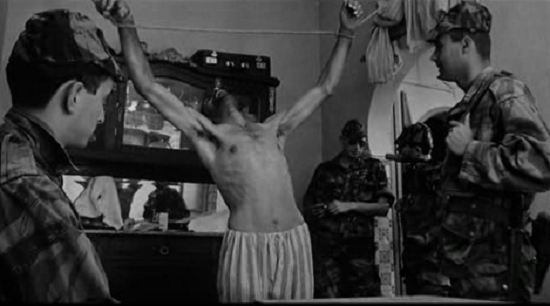 This film shows torture as an integral part of colonialism. The sequence from Battle of Algiers shows three women preparing their masquerade before a mirror. The mood is tentative, almost trembling. The lighting highlights the women’s faces as they remove their veils, cut and dye their hair, apply makeup to look more like European. They look at themselves as they put on an enemy identity, ready to perform their national task. Whereas in other sequences Algerian women use the veil to mask acts of violence, here they use European dress for the same purpose. One woman, Hassiba, first seen in traditional dress, her face covered by a veil, might in Western context be received initially as a sign of the exotic, yet soon she becomes an agent in national transformation where masquerading as the colonizer plays a crucial role. As the sequence progresses, we become close to them, paradoxically, as they perform “Europeanness”. At the same time, we are made aware of the absurdity of a system in which people warrant respect only if they look and act like Europeans. The film thus demystifies the French colonialist myth of assimilation, the idea that a select coterie of well-behaved subalterns could be integrated into French society in a gesture of progress and emancipation. Algerians can assimilate, the film suggests, but only at the price of shedding everything characteristically Algerian about them-their hair, their clothes, their religion, their language. 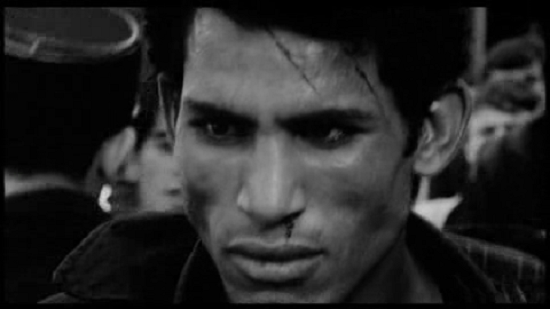 “Battle of Algiers’ is particularly subversive in controverting traditional patterns of cinematic identification. Many critics impressed with the filmmaker’s honesty in FLN terrorists acts against civilians, lauded the sequences of women planting bombs for its “objectivity”. 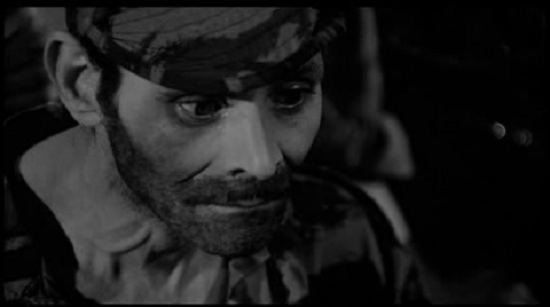 The film makes us want the women to complete their task, if not out of conscious political sympathy then through the specific protocols of cinematic identification: scale (close-up shots of individualize the women); off-screen sounds (the sexist comments of French soldiers are heard as if from the women’s aural perspective). 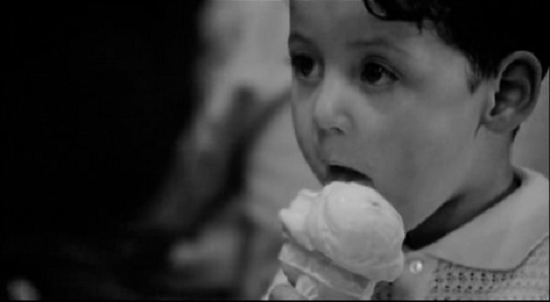 At the same time, the film does not hide the terrible injustice of terrorism; it is encapsulated in the absolute innocence of a child eating ice cream. 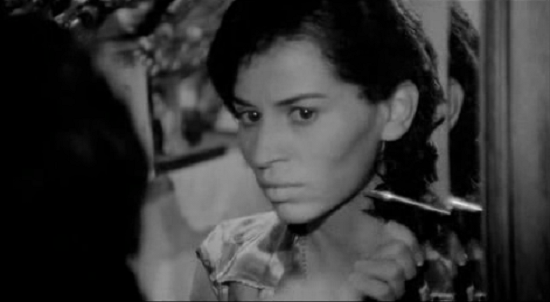 The eyeline matches between close shots of the bomber and of her intended victims both engender and disturb identification; for although the patrons of the café she attacks are humanized by close-ups, the film has already prepared the spectator to feel at home within the bomber’s perspective, to sense the reasons for such a mission. Each side experiences "a duty of resistance," committing heinous war crimes to achieve their political goals. The French police aren't above secretly bombing the house of an innocent man in the Casbah, killing dozens of civilians, while the FLN carries out a devastating three-pronged attack on different hotspots in the European district. Pontecorvo always hovers on the aftermath of each attack, watching as French and Arab bodies are pulled from the rubble, faceless innocents masked by layers of dirt and blood. 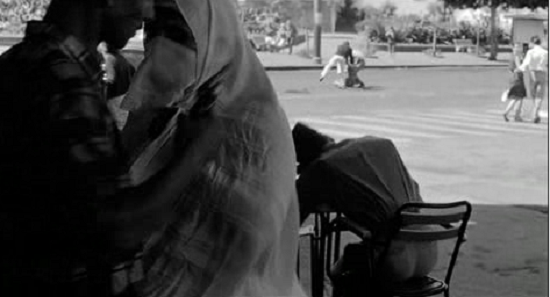 The Battle of Algiers isn't just a political beast, but a cinematic one as well -A fitting complement to Pontecorvo's penetrating compositions and DP Marcello Gatti's nimble camera work, Ennio Morricone's score echoes through the cramped Casbah avenues like a call to arms. The pouncing musical notes crescendo during moments of mass tumult, and together all three artists perform a balancing act of epic proportions; a complex historical moment is recreated from the gritty ground up. Politicians are expectedly nonexistent in the constantly evolving social world of The Battle of Algiers, their voices only heard via radio or transmitter dictating orders that are as ignorant as they are abrasive. They are the true inglorious bastards. Ultimately, Ali and Jaffar are overrun after Col. Mathieu locks down the city during a military surge ironically called Operation Champagne. But the final moments in the film prove that the French colonialist machine has very little to celebrate. Shots of tortured prisoners dissolve into massive protests by regular citizens demanding freedom, and these large groups clash with riot police only to be mowed down by machine-gun fire. The striking images overlap, the unrest growing more intense with each passing montage. This sequence is a potent precursor to the fact that Algeria attained independence a few years later in 1962. 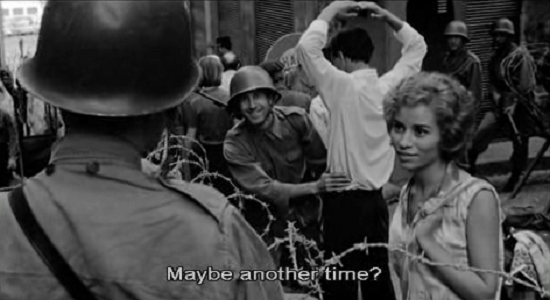 More than any other, one line of dialogue sums up the film's unique balance of romantic lyricism and hard-nosed realism: "Violence itself does not win wars. The people themselves must act." This statement by a high-ranking FLN leader becomes a prologue of sorts to the countless civilian revolutions that have dominated the nightly news every decade since. The Battle of Algiers may have been released in 1966, but its powerful influence still holds violent sway in the volatile streets of Egypt, Lebanon, and Syria. Great protest art like Pontecorvo's will always be necessary.